Gov. Eric Greitens sits down for an interview with St. Louis Public Radio in downtown St. Louis on July 17, 2017. In the span of a week, Gov. Eric Greitens unveiled two high-profile proposals: A proposal aimed at reducing violent crime in St. Louis and a statewide prescription drug monitoring program. Critics of the Republican governor contended the plans lacked specificity – and questioned whether either proposal would stem the tide of St. Louis violence or opioid abuse. But in an interview with St. Louis Public Radio on Monday, Greitens positioned his two plans as "bold" action that should have been taken a long time ago. At the same time, Greitens repeatedly expressed a willingness to work together and incorporate ideas from some of his political adversaries. On St. Louis on the Air, St. Louis Public Radio reporter Jason Rosenbaum discusses and shares clips from a one-on-one interview with Missouri Gov. Eric Greitens about his proposals for a St. Louis crime plan and a statewide prescription drug monitoring program. During protests over Michael Brown’s death in Ferguson, I heard over and over from African-Americans their stories of being harassed by police. With the understanding that the Missouri State Highway Patrol is well-trained and well-regarded, what confidence can you provide the African-American residents of St. Louis that more highway patrolmen being in the city is not going to lead to an increase in racial profiling? "You’re right that the members of the Missouri State Highway Patrol are professionals who hold themselves to the highest standards," Greitens said. "And, in fact, when I spoke to all of these volunteers before they went out on this assignments, I said one of the things that gives me so much confidence about sending them out onto the streets is I know in every interaction they have with every citizen of the state of Missouri that they’re going to bring that same level of respect and dignity. "And just to give you a concrete example of what this looks like: I was out on the first Sunday night that they were out. I was riding with the state’s director of the Department of Public Safety. We pulled up on a car that had been abandoned. And as we pulled up, the owners of that car also pulled up. They had a flat tire. The state’s director of our Department of Public Safety and two members of the Missouri State Highway Patrol got out of the car and were down on their knees on a hot night in St. Louis changing the tire. And they’ve been out helping men and women who have had car crashes. They’ve been out changing tires. They’re doing this work. "And I think what they’re doing is creating a culture of public safety so that people can trust in our law enforcement officers. Because that is part of what we need to create a culture of peace." What has your administration done to help the economic fortunes of parts of St. Louis with high crime rates, since poverty is often cited as a root cause of violence? Tierra White holds her two-year old daughter, Taylor, during a Save the Raise rally outside Southwest Diner. Greitens is letting a bill go into effect that will strike down St. Louis' higher minimum wage. "One of the things we said from the very beginning at the State of the State address is in order to create peace in our communities, there’s a component of law enforcement," Greitens said. "You have to involve the business community. You have to involve clergy. You have to give people confidence in our justice system. But exactly as you said, Jason, you’re exactly right about this. People also have to have economic and educational opportunity. Click on the audio above to listen to the full interview between Gov. Eric Greitens and St. Louis Public Radio's Jason Rosenbaum. "I’ll give you just a couple of specifics of some of the things that we’re doing. First of all, we signed right to work legislation. This is actually really important to put Missouri on the map, to let people know that Missouri was open for business again. And I can tell you, from working with businesses who are selecting the sites where they might build and invest, Missouri is now on their list. Missouri is now a place where they’re thinking about coming. … We’re taking on nasty trial lawyers who have been driving businesses out of the city of St. Louis and the state of Missouri. All of those things are important for us to do." 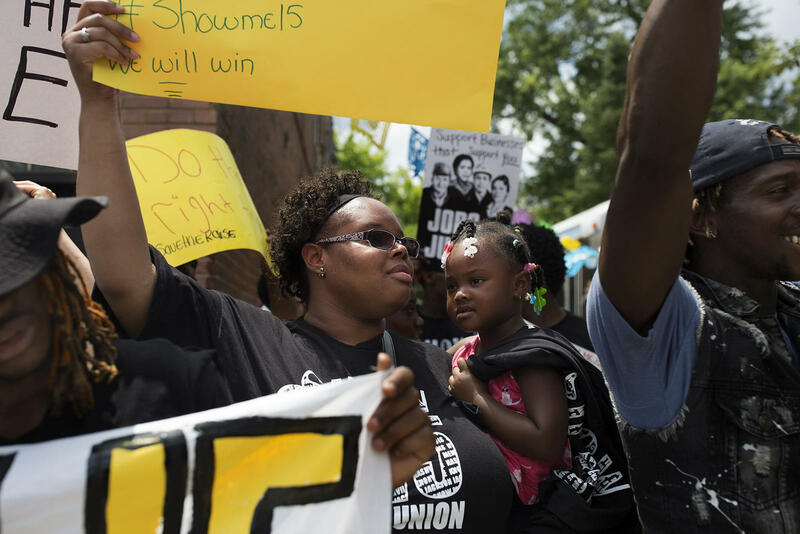 Why do you feel somebody in north St. Louis or south St. Louis should care about “right to work” or “tort reform” when they can’t even find a job or send their kids to a good school? "I think that they do care about these things, because what they’ve seen is that by these reforms we’re letting people know that Missouri is open for business," Greitens said. "And businesses are now moving to Missouri. They’re starting to invest in Missouri, because they’ve seen that we’ve sent the word out that Missouri is open for business. And this ends up making a difference at the level of just the average worker and their family." What role did local officials have in developing the crime plan? State Rep. Bruce Franks was one of numerous St. Louis elected officials who criticized Greitens' crime plan. The St. Louis Democrat contends Greitens' proposal doesn't get to the root causes of violence. "We’d actually started talking with Mayor Slay when he was in office," Greitens said. "And then we were talking with Mayor Krewson when we knew that she was going to become the incoming mayor. We talked with her before she even took office. And since that time, our public safety teams have not only been talking with the mayor, but perhaps even more importantly, they’ve also been talking with the city of St. Louis about their police officers on the front lines. "We’ve been talking with [interim St. Louis Police Chief Lawrence O’Toole]. We’ve been talking with [St. Louis County Police Chief Jon Belmar]. We’re working with people at the local level to get them involved. And yes, there’s state representatives and state senators who have come to see us in the legislature. "This is the beginning of the mission. And just like I was a Navy SEAL, we’d execute an operation and then we’d go forward and see what works. And if it’s working, we’ll do more of it. If it’s not working, we’ll do less of it. And we invite feedback — and we invite input from anybody who is working on this problem out on the front lines. The only thing we won’t accept anymore, and you’ve heard me say this, we won’t accept excuses." One of the things I’ve noticed is that politicians are dealing with heroin and opioid abuse as a public health crisis. That’s compared to the 1980s during the crack epidemic, when primarily African-Americans were thrown in jail. I’m curious if you believe that handling drug addiction by throwing people in jail rather than rehabilitating them wasn’t the way to go, especially since you had a cousin who died of a heroin overdose. "One of the things that I would say that is so important is we do recognize that this is a public health emergency," Greitens said. "There is absolutely a component for law enforcement to play. There’s a component for the private sector to play. You saw today we announced some of our private sector partners who are working with us. There’s a role for the government to play. "But it’s important for people to recognize that with this heroin epidemic, we’re not going to arrest our way out of this problem. This is a problem where we have to deal with drug courts. We have to deal with treatment. We have to deal with what’s happening inside of our justice system. These are complex problems. And again, the only thing that’s unacceptable to us are excuses. We’re here to take action and to recognize what this is: It’s a public health emergency." U.S. Sen. Claire McCaskill released a statement that raised doubts about whether your prescription drug monitoring executive order would succeed, primarily because doctors and pharmacists cannot access the system you set up. Why is a system that state government can access better than a PDMP accessed by medical professionals? Greitens also said his prescription drug monitoring program will not conflict with a database that St. Louis County started operating earlier this year. "Well, look: This is a really strong approach that we’ve put in place with our executive order," Greitens said. "And you should know, Jason, I recognize any time we take strong action to address the crime problem or opioid addiction — there’s going to be critics and there are going to be politicians who talk and talk and talk about this problem. "But I think what’s giving people such confidence is that we’re willing to step out and to take action to save lives. Just a little history here: We had prescription drug monitoring programs in the United States since the 1930s. And we went out and what we did as a team was we studied what works. We studied what works in other states and we studied what works historically. The point of a prescription drug monitoring program is to make sure that you can look at the misuse, abuse and diversion of prescription drugs. What our program allow us to do is it allows our Department of Health and Senior Services to see the source of the problem." On Friday’s “Behind the Headlines," we took a look at a top news story from the week. This week, St. Louis saw its first election under the new voter photo ID law for the 28th ward seat. Heather Navarro, a Democrat, won with 69 percent of the vote. On Friday’s “Behind the Headlines," we took a look at a top news story from the week. This week, host Don Marsh was joined by St. Louis Public Radio reporter Jo Mannies to discuss Missouri Gov. Eric Greitens's interactions with the Missouri legislature and the recent special sessions.